Card-making-magic, Issue #015--Is it still Summer? Is it still Summer? beacause this month has seen a lot of magazines and TV channels turn to thoughts of Christmas. But I haven't had my Summer Holiday yet so I don't want to think about the jolly season, thank you very much!! Instead I prefer to stay in summer mode for cardmaking, with maybe just the odd one tinged with Autumnal shades.....well at least until the end of September. 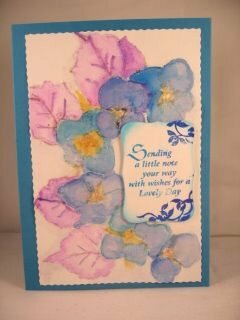 This Crushed Flower Card is one of the New Videos added to the website. And this is the result you can achieve with a little help from an ink pad and a waterbrush to bring out the colours. I had an email from a lady who told me it took her sometime to realise that they were real flowers. She didn't know why she couldn't get the same result!! Fortunately she got it, and is now happy with the cards. 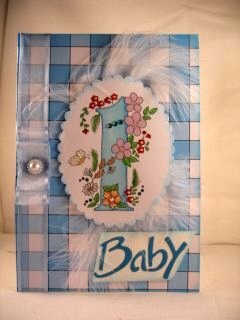 I promised backing papers thatI have been making, and here is a new collection. I know these are also simple designs but they are yours to try out. Let me know what you think please, as all feedback is appreciated. I would like to send my most sincere "Thanks" to the lady in Canada who very kindly offered me some tuition on a software programme I had purchased. We spent three hours online via "Skype" and eventually I got it, so thank you Mara for your patience. I will do my best to fulfill your requests if there is something you would particularly like to see, but it may take some time, as I am still learning, and it's a steep curve! More will be added as I go along. Wish me luck with the learning!! I have also been asked several times, how to fit an insert inside a tri-fold card, and so I have added Tri-fold Card Inserts to show you one of the ways it can be done. Maybe you have a different way....then let me know and I can add it to the website. But now you can see how to make the insert and the Tri-fold Card Itself. As always I am amazed at the email I get from all over the world, and I want to say "thank you" to everybody for all your news, chat and questions, please keep them coming. I am only to willing to help wherever I can, and if I don't know the answer I will endeavour to find out for you. And last but not least...card-making-magic.com has now joined "Facebook". If you want to add the website as a friend please let me know that you are a subscriber. But the quickest way to get an answer to any questions will still be through an email to the website.